Thirty-third Edition, Northampton, Mass. : Bridgman & Childs. 1863. 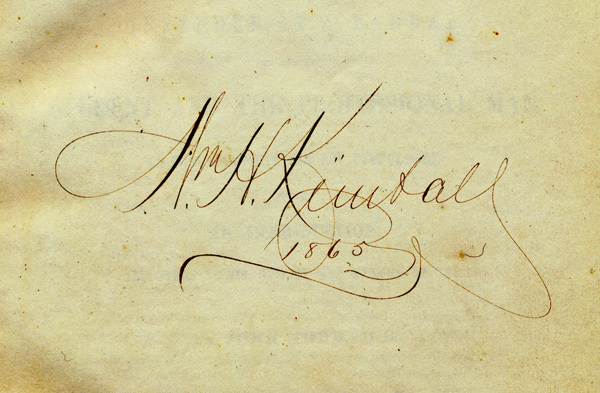 A William H. Kimball (1817-92) was born at Goffstown and died at Concord, both New Hampshire. He was a merchant, artist, newspaper publisher, photographer, state legislator, [and] Librarian – State Library. source. It is only possible that this is our Wm. H. Kimball. Shown below are only a few of the entries; I expect to include all of them. None of the sources are certain, as to edition; almost all of the passages can be found in multiple locations — books, journals and newspapers — in the latter half of the 19th century. 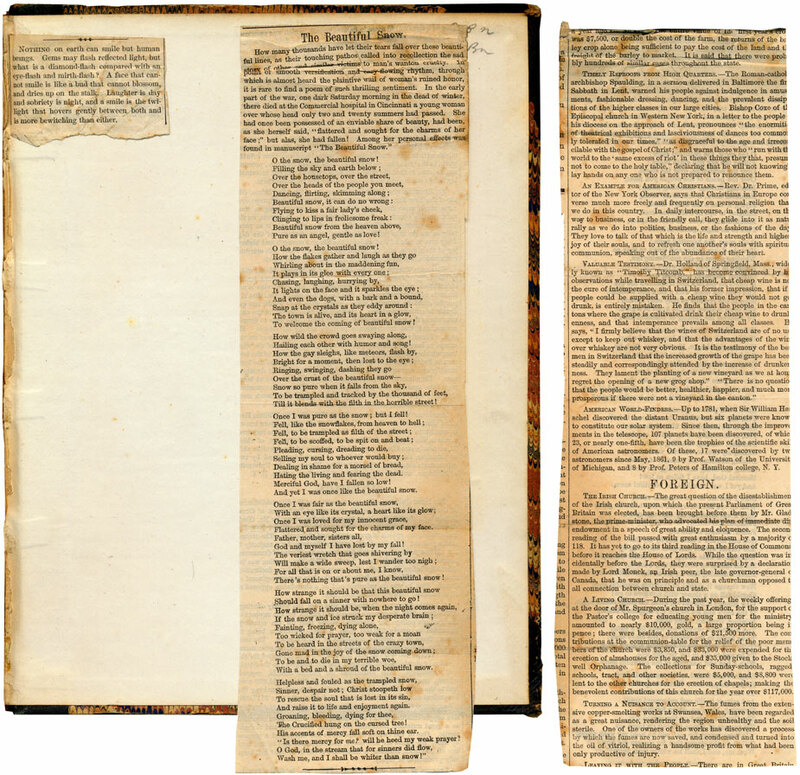 Two newspaper clippings pasted to the rear endpaper may help date the usage of this copy, ca 1868-1872 (see discussion following the list of extracts). The book is signed by its owner Wm. H. Kimball, 1865. Three entries under HaaH (at left) and signature on first free flyleaf. This copy was lightly used as a commonplace/extract book, not index. Notations are made in what I make out to be three different hands (that will later be identified as A, B and C). All of the entries might be classed under the heads spiritual or practical wisdom, and most have an aphoristic quality. Only a few are presented below (for now). The presentation of sources in the right column is intended only to show the range of publications from which these extracts might have been drawn; I do not claim that any of them are Kimball’s actual source (as is more easily done for entries in Index Rerum of a more scholarly or clerical nature). Afflictions Hearts, like apples, are hard and sour, / Till crushed by Pain’s resistless power; / And yield their juices sick and bland / To none but Sorrow’s heavy hand. Bittersweet this may be J. G. Holland, Bitter Sweet : First Movement — First Episode, as given in Stokes’ Encylopedia of Familiar Quotations (1906) here. "Ballads Are the gipsey-children of song — born under green hedge-rows, and along the leafy lanes and by-paths of literature — in the genial summer time." Longfellow. Benevolence Benevolence is like the dews of heaven, which falling silently and unobserved, see not to attract attention but to do good. Beauty As amber attracts a straw, so does beauty admiration, which lasts only while the warmth continues; but virtue, wisdom, goodness, and real worth, like the load stone, never lose their power. These are the true graces, which as the poet feigns, are linked and tied hand in hand, because it is by their influence that human hearts are so firmy united to each other. Burton here and there, including F.S. (Frederick Saunders), Pearls of Thought, Religious and Philosophical, Gathered from Old Authors (New York: Stanford & Delisser, 1858), under the heading Moral Beauty. Bible As the moaning shell whispers of the sea, so the Bible breathes of love in heaven, the home of angels, and joys too pure to die. Books Hope and the world are full; and he who drags into book-pages a phrases or two of the great life of passion, of endurance, of love, of sorrow, is but wetting a feather in the sea that breaks ceaselessly along the great shore of the years. Every man’s heart is a living drama, every death is a drop scene; every book only a faint foot light to throw a little flicker on the stage. D. G. Mitchell’s Dream Life, here (extract does not match word for word). Pope Boswell’s The Life of Samuel Johnson, here (bottom right of page). "Vice is a monster of so frightful mien / As to be hated, needs but to be seen; / Yet seen too often, familiar with his face, / We first endure, then pity, then embrace." 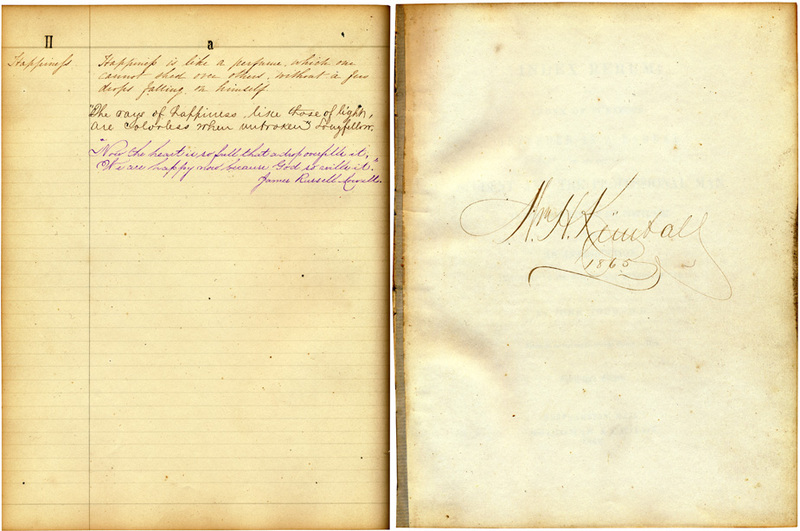 Two clippings on back endpaper, showing reverse at right. The Beautiful Snow was taken up by several papers, for example here, in The Journal of Education for Ontario (Toronto), Vol. 21 No. 12 (December 1868), where there is provided a more detailed — even explicit — description of the fallen woman, with its depiction of a fair brow upon which had long been written that terrible word — prostitute! . The poem (and a short introduction) also appears in the Pittsfield Sun of November 27, 1872. Regarding one of the notices on the obverse of this poem, a different account of the Valuable Testimony of Dr. Holland of Springfield, Massachusetts on the temperance question (wine in Switzerland no improvement over whiskey) appeared in the Cincinnati Daily Gazette on November 25, 1868.